LEMOORE, Calif. - The wave shouldn’t be here, surrounded by boundless fields of nuts, vegetables and cotton. It’s an exotic crest of water six feet high, one that would be at home in Bali or the east coast of Australia. But not here, well over 100 miles from the Pacific Ocean. The idea of belonging, of context, has always been central to those who ride the best waves. Surfing was born centuries ago in the South Pacific and Hawaiian islands, where it is called he'e nalu, then rebranded starting in the early 1900s in California. From the Golden State it spread to the rest of the world, surfers always beholden to the finicky variables of their passion - tide and wind, swell and direction - and enamored of its offbeat culture. For some, it remains less a sport than a lifestyle. So to find a wave like the one that surfaces in the middle of the San Joaquin Valley, which is to say a nearly perfect curl, is bizarre. And very tantalizing. This is what has drawn 54 of the planet's best surfers, who are competing in a vast concrete pool that is intended to introduce the sport to a new audience ahead of its Olympic debut in 2020. Only once before has an international event been held nowhere near open water - the first contest, several decades ago, was a disaster - and the $30 million artificial-wave complex constructed in the small farming town of Lemoore has elicited awe within the surfing community. "It's a beautiful wave to surf, it's surreal," said a beaming Courtney Conlogue, who last year was ranked fourth in the world. "I love what it's going to bring to the sport." Yet Surf Ranch has also divided the community. Surfing historian Matt Warshaw sees wave pools as direct assaults on the very nature of the sport, from the unpredictability of its ocean setting and the nuanced forces that must be understood to the experience and skills accumulated over a lifetime. "Now it's more like a skatepark. You've thrown away the part that makes surfing the most compelling," said Warshaw, whose "Encyclopedia of Surfing" and "History of Surfing" are considered definitive texts. "Something really fundamental is changing." The competition, which started Thursday and continues through the weekend, allows surfers half a dozen rides per round as spectators line the 766-yard sideline - longer than six football fields. Each wave is created by a hydrofoil pulled by cables through the water. The technology has approximately 50 settings to provide variation in the waves' height, shape, angle, power and speed, and an artificial reef on the pool's bottom surface produces conditions where surfers might tuck within the tube, or barrel, of a wave - the sport's Holy Grail. The rollercoaster-like clicking and whirl of that hydrofoil provided a bass line as announcers called the action on day one. 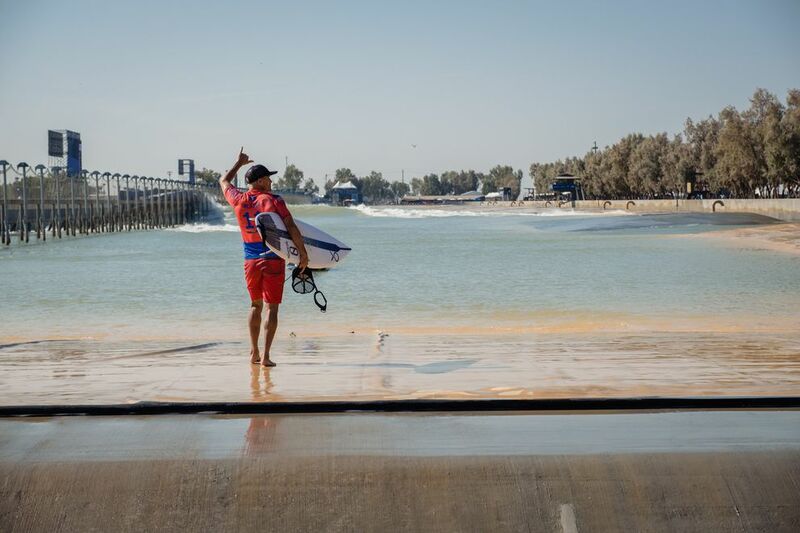 For the World Surf League Championship Tour, conditions were next to perfect, with blue sky and a blazing sun. Five towering screens opposite the stands gave everyone a close-up view as each athlete flipped, turned, snapped and maneuvered on the minute-long wave, a blissful eternity that the natural world virtually never permits. "Surfing now can go to markets that we've never dreamt of," said WSL chief executive Sophie Goldschmidt, who is already talking about future deployment of artificial-wave systems. The advantages are obvious, she noted: Rather than wait for the ocean to deliver the waves, such systems can create them on a fixed, broadcast-friendly schedule. The inspiration behind Surf Ranch is 11-time world champion Kelly Slater, a tanned Florida native who at 46 remains a surfing icon. He spent years researching and developing the project, which today he says he built "mostly just for people who love surfing. . . . My vision was to make the best wave possible." Construction began in secret in 2013, backed by Slater and a small group of investors. In late 2015, he released a tease video that was surfers' first glimpse of their potential future. His company as well as the complex are now owned by the World Surf League, with Slater remaining actively involved in both. 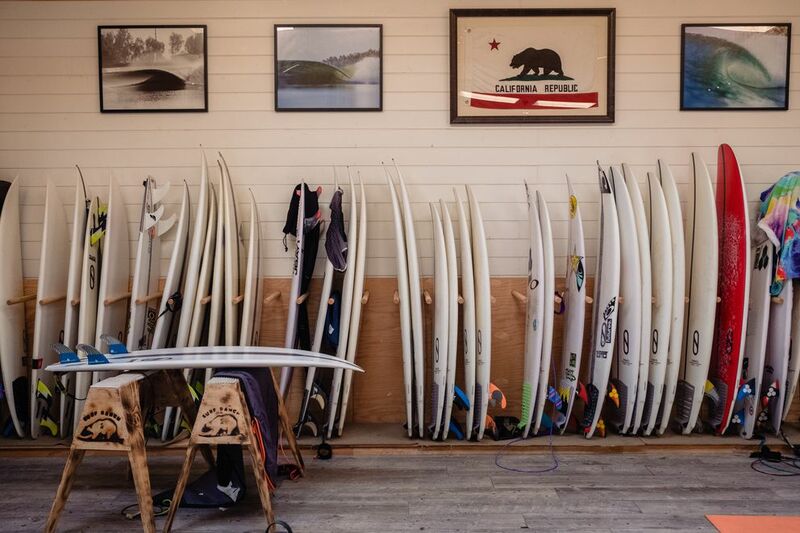 "It's pretty obvious that the era of man-made wave technology is here," he said in early August while chilling in the lounge, which features a rack of colorful boards and three of his world championship trophies. He is well aware of the mixed emotions about the place and admits to having had some himself, wondering if he'd made a "surfing version of a nuclear bomb." The answer is no, he decided. No matter how often he takes to the water in Lemoore, "I'll probably never the rest of my life pass up a chance to go find something I haven't done before. That's the journey of a surfer, that's the lifelong pursuit." Artificial waves go back to at least the late 1800s - to the lake at Bavarian King Ludwig II's palace near Oberammergau - and commercial wave pools date to the 1920s. The quality of waves here is purely 21st century, the brainchild of Slater and lead engineer Adam Fincham, a University of Southern California associate professor who specializes in geophysical fluid dynamics. According to Fincham, each pull of the hydrofoil from one side to the other requires about 5,000 horsepower of energy. The shape of that mechanism is what's key, allowing different types of waves. "That's the magic of what we've done," Fincham said, disclosing only the sparest of details. And their work is far from complete. Slater thinks the team has explored no more than 20 percent of the possible wave manifestations in the 15 million-gallon freshwater pool. Fincham is looking ahead, too, thinking about how to make "a so-called supernatural wave, a wave that doesn't even exist in nature . . . that maybe a kid would sketch in a book," he suggested with a grin. Crowds are expected through the weekend to watch the competition. Lemoore Mayor Ray Madrigal said its 25,000-plus residents have embraced Surf Ranch, which has hosted special community days, hired locals, financially supported other recreational activities and played a role in creating a city flag - since Slater and crew wanted to fly one and no such flag existed. "We can't pay for this kind of awareness," Madrigal said. After the tour, the property is slated to continue serving as a prototype research facility, a training ground for pros and a setting for events with VIPs, locals and nonprofits. Approved zoning applications mean additional pools can be built. The nation's two other surf pools - in Texas and even farther from open water - are also pushing the technology forward. The WSL plans to build more venues in California and Florida, as well as in Japan, Brazil, Australia and other countries, according to Goldschmidt. Warshaw admits that when he visited Surf Ranch last November, he found its waves to be "mesmerizing." But in between his rides "felt really empty." The "true nature" of surfing, he believes, is inseparable from the ocean. The philosophical debate was far from the scene Thursday as surfers began taking their opening jabs at the wave, aiming to find their groove and qualify for Sunday's finals. Patrick Gudauskas, a blond, ebullient Californian, tried a novel approach by consulting his pro snowboarder buddies for advice on how to choreograph his run. Several athletes admitted to feeling a unique kind of pressure since there was no possibility of blaming the wave for any mistakes. Kanoa Igarashi, who hopes to represent Japan in the upcoming Olympics, is on a return visit to Surf Ranch. He competed at an exhibition contest here in May, when, with the challenge rising and spectators' cheers like an audible force, he experienced a transcendental moment on the water. It still triggers goosebumps.